Our faculty focuses our research efforts to harness the potential of superdiversity in education and social justice issues - nationally, regionally and globally. Our commitment to the highest quality research ensures that our teaching is informed by the most current research and evidence from practice. Faculty researchers explore educational and social science research from a wide range of perspectives, much of which is aligned to the central theme of superdiversity and five key sub-themes listed below. The overarching goal of this sub-theme is the promotion of scholarship and research into teaching and learning at all levels that will make a positive impact on practice and outcomes. The overarching goal of this sub-theme is the promotion of scholarship, research and practice that will advance equity for all sectors of society. The overarching goal of this sub-theme is the promotion of scholarship, research and practice that will enhance social change, social justice, and well-being for all sectors of society. The overarching goal of this sub-theme is the promotion of scholarship and research into indigenous issues and concerns that will make a positive impact for Māori. The overarching goal of this sub-theme is the promotion of scholarship and research that recognise that, as an institution located in a superdiverse city, we have much to contribute in this space internationally. 1Chen, M. (2015). 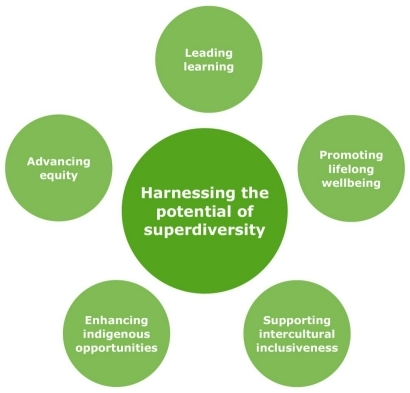 Superdiversity Stocktake: Implications for Business, Government and New Zealand. Auckland, NZ: Superdiversity Centre. 2Vertovec, S. (2014). Reading ‘Super-Diversity’. In Anderson, B. & Keith, M. (Eds.). Migration: The Compas Anthology. Oxford, UK: ESRC Centre on Migration, Policy and Society.